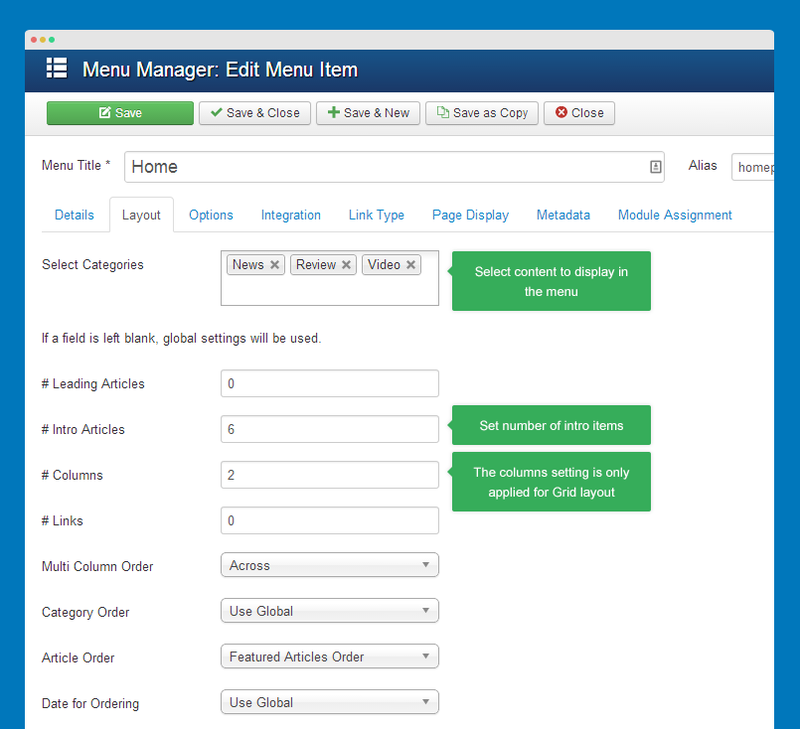 Template style feature (version 2.5 and above) is to assign different template styles to individual menu items. The default template style can be partially or completely overridden by assigning different template styles to the desired menu items in order to obtain a different look for their respective pages. From back-end setting, go to: Extensions >> Template manager. 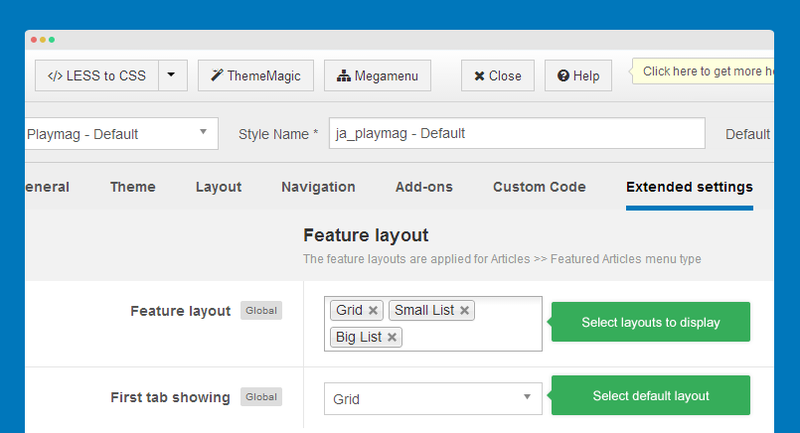 Select the "ja_playmag - Default" template style then hit the "Duplicate" button to clone the template style. 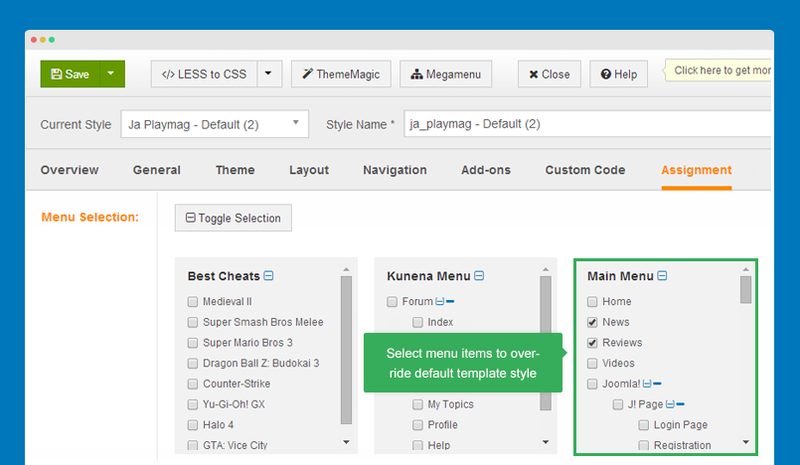 Next, open the template style, configure theme, layout, etc then assign the template style to the menu items. Those menu items will have template style overridden the default template style. 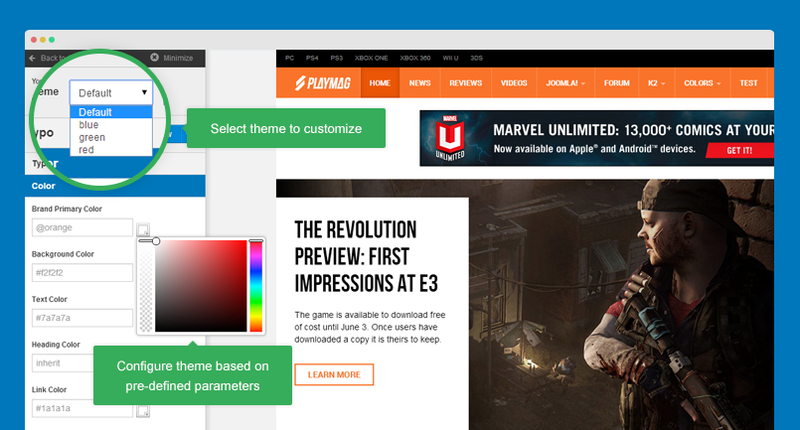 You can use multiple themes simultaneously in a site by creating template styles, each template style is assigned for a theme. Open template style you want to change theme, in the "Theme" tab, select the theme you want to switch to. The template has only one layout by default. However, you can create new layout, configure it as you wish. Open the template style you want to configure layout then go to "Layout" tab. Open any template style, go to "Layout" tab, assign layout. The layout is applied for the template style only. 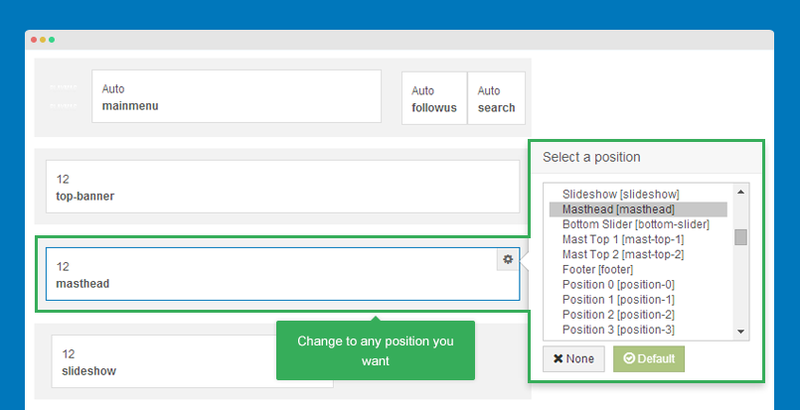 Hover the position you want to change, hit the setting icon then select the position you want to change to. This feature is only applied for spotlight block. 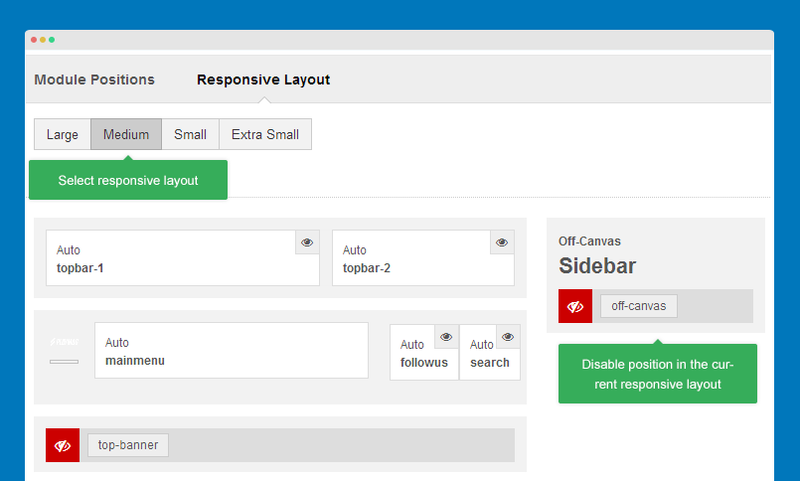 The responsive layout configuration allows you to enable, disable positions in specific layouts (Large, medium, small, etc). You can also resize positions in spotlight blocks. 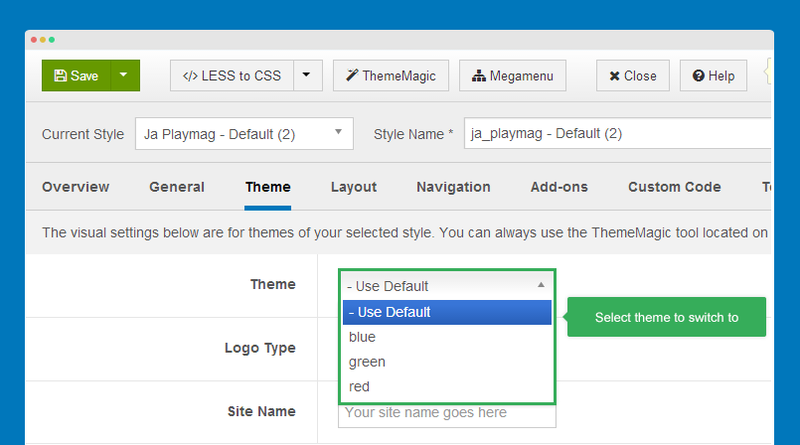 ThemeMagic is to customize your theme based on pre-defined parameters so that you don't need to touch any file. Firstly, you have to enable the "ThemeMagic" feature. Open any template style manager, in the General tab, enable the ThemeMagic option. Next, hit the "ThemeMagic" button on the top bar list to open the ThemeMagic working panel. In the setting bar, open the parameter group you want to configure, change value for the pre-defined parameters then hit the "Preview" button to see how front-page changes. If you satisfy with the customization, please save it. For safe, you can save as the theme. 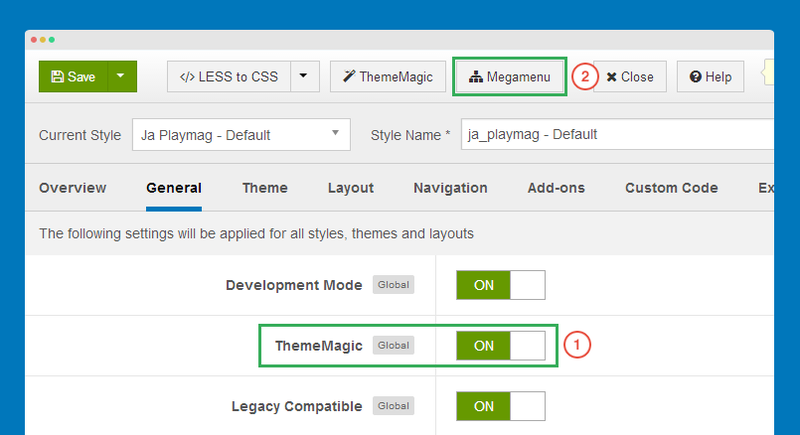 If you want to add new group and parameters to ThemeMagic to customize theme, please refer to T3 documentation. 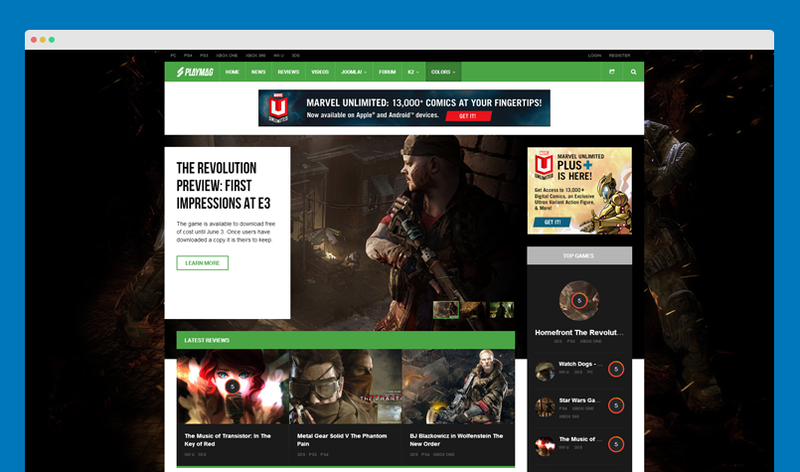 JA Playmag template has 2 extended options: Feature layout configuration and body background. Please note that these options are implemented in JA Playmag template only. 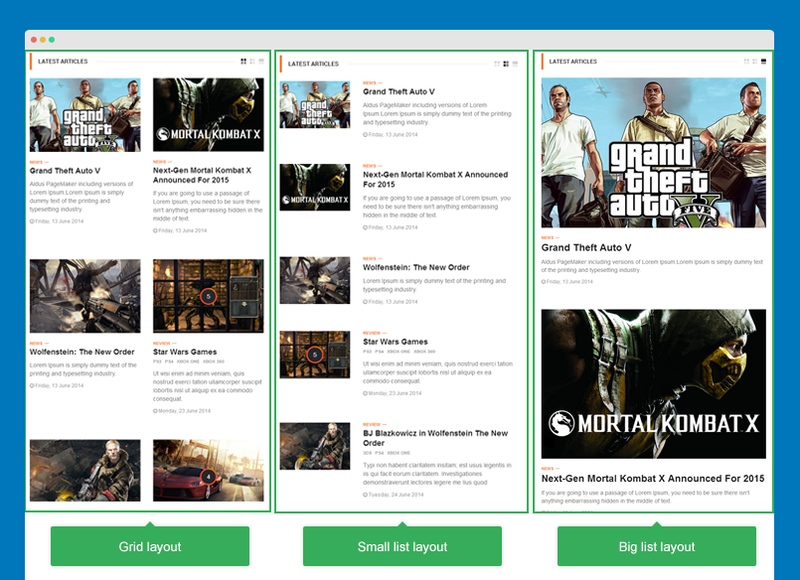 There are 3 feature layouts: Grid, big list and small list. 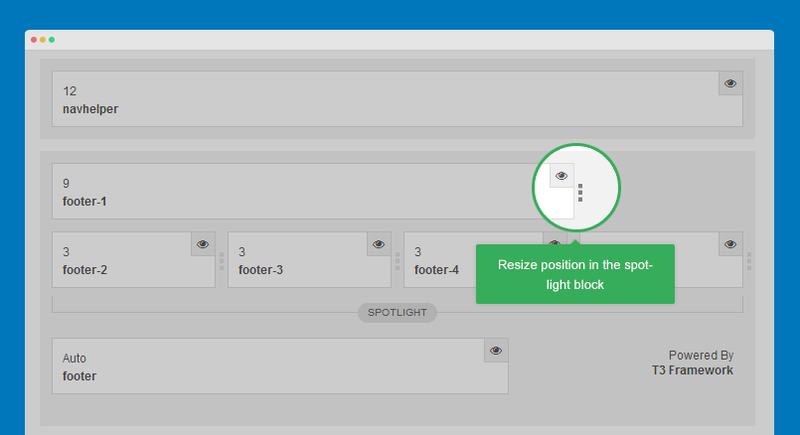 To configure the feature layouts, open template style you want to change the layout. 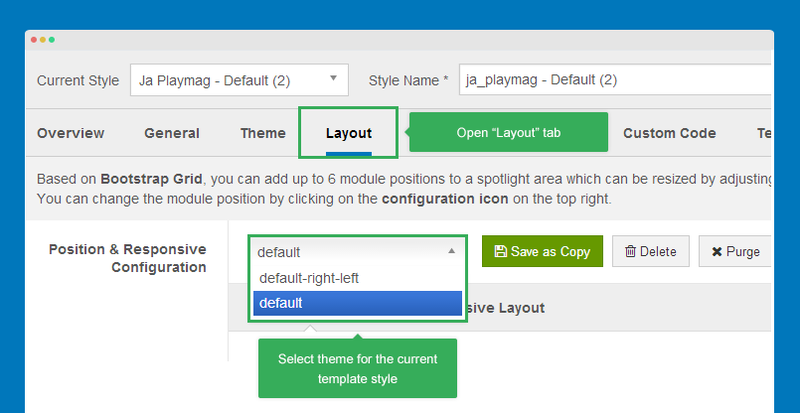 In the "Template config" tab, select layouts you want to display and don't forget to choose the default layout. 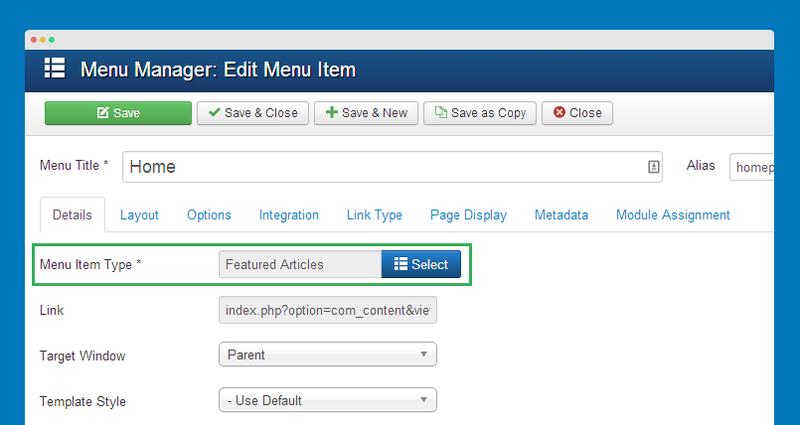 The feature layouts are applied for "Articles >> Featured Articles" menu type only. 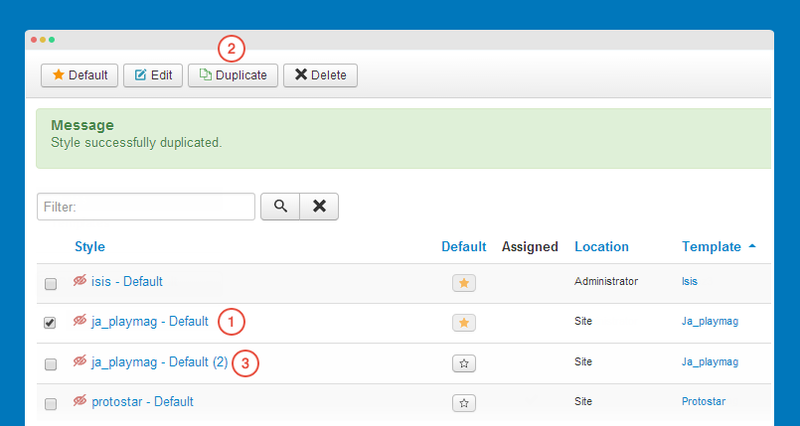 If you want to add new feature layout or customize any layout, this guideline will help you. Each layout has its own class. Its HTML mockup is the same. You can check the style of the classes in the file: templates\ja_playmag\html\com_content\featured\default.php. You can change background for any page. In the "Body Background Image" tab, there are 3 background image options. Browse image you want to display as background. If you choose 3 background images. In front-page, each time you refresh, it will randomly display the background image.